Type of cuisine:French; Opening hours:12:00-14:00 / 19:00-23:30; Our lounge area allows you to enjoy lunch or dinner in a relaxed, friendly environment.Opening hours:07:00- 01:00. 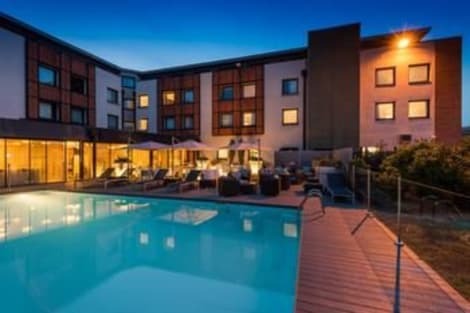 Convenient hotel near Toulouse-Blagnac Airport with a restaurant and a pool Holiday Inn® Toulouse Airport hotel is an eight-minute walk from Patinoire Barradels tram stop and 20 minutes by car from the city centre. Business travellers are conveniently close to Airbus headquarters and have a 15-minute drive to Pierre Baudis Congress Centre. The hotel has 8 meeting rooms, offering space for up to 200 delegates, and a 24-hour business corner. Key sights less than 10 minutes away by car include the Aeroscopia aviation museum, the Airbus visitor centre and the Ernest-Wallon rugby stadium. Alternatively, head into central Toulouse to admire the city’s medieval architecture or to take a cruise along the scenic Canal du Midi. At this hotel you can enjoy: - Free, fast WiFi throughout the building - A seasonal outdoor swimming pool with sun terrace - A mini gym - Free parking Renovated, aviation-themed rooms have convenient work desks and offer quality bedding, a pillow menu and satellite TV to help you relax after a busy day. Bedrooms with sofa beds are ideal for families, and kids stay and eat free. Start your day at the delicious American breakfast buffet, and for lunch or dinner order perfectly grilled steak at the Black Angus steakhouse. Aviator bar offers sports on TV and an extensive drinks menu.